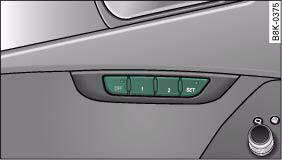 You can use the recall buttons in the driver's door to store and recall the seat adjustments for two drivers. You can store and recall the settings for two different drivers using the recall buttons 1 and 2, fig. 77. In addition, the current settings are automatically stored when you lock the vehicle and assigned to the remote control key that is being used. When you unlock the vehicle, the system automatically recalls the settings stored on that remote control key. The seat memory will be out of action if the OFF switch has been pressed and the diode in the switch is lit. In this case, the setting cannot be stored. The stored settings will all remain in the memory. However, the seat can now only be adjusted using the conventional electrical adjustment. – Adjust the driver's seat as required. – Adjust both exterior mirrors. – Press the SET button. The diode in the switch will light up to indicate that it is ready to store the settings. Now press the desired recall button for at least a second. – Release the button. The setting is now stored on the selected recall button. – If the driver's door is open, press the desired recall button briefly. – If the driver's door is closed, press and hold down the desired recall button until the programmed settings are reached. A tone will sound and the diode in the SET button, fig. 77 will light up to confirm that the settings have been stored. When you lock the vehicle the current settings are automatically stored and assigned to the remote control key. However, the settings assigned to the remote control key will not overwrite the settings stored on recall buttons 1 and 2. The settings stored on the recall buttons can be called up at any time. When you unlock the vehicle, the settings assigned to the remote control key are recalled automatically. If your vehicle is also driven by other persons using your remote control key, it is advisable to store your personal settings on one of the recall buttons. You can then recall your own settings at any time simply by pressing the corresponding recall button. When you lock the vehicle these settings are then stored automatically and assigned once again to the remote control key. • For safety reasons, never recall seat settings when the vehicle is moving - this could lead to an accident. • In an emergency the recall function can be stopped at any time by pressing the switch, or by briefly pressing any of the recall buttons. The relevant function must be activated on the sound system or MMI* so that the settings stored in the memory can be recalled using the remote control key. – Select: Function selector button CAR > Seat adjustment > Driver's seat > Remote control key > on.